Since September 11, 2001, new requirements for due-diligence searches have emerged to ensure that banks and other individuals know with whom they are doing business. No one wants to be party to assisting terrorists, money launderers or people trying to avoid paying taxes or adhering to economic sanctions laws. Any apparent matches must be researched and reported to OFAC and they will notify you whether the match is in fact legitimate. If it is, you will not be able to proceed with the transaction with that individual involved. The requirement to check the SDN list was implemented as part of the Patriot Act in the aftermath of 9/11. 2. 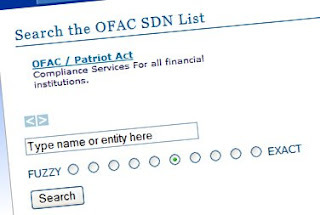 Searches of ANY list distributed by the federal government naming terrorists, money launderers or individuals avoiding payment of taxes or economic sanctions - The SDN list is by no means the only list of sanctioned companies and individuals maintained by the federal government. All available lists must be checked to ensure that business is not being transacted with any sanctioned individual or company. Trying to identify and check each of these lists can be a nightmare. Fortunately, there are companies which specialize in these required due-diligence searches and Parasec has a good relationship with a nationally recognized firm in this area. Let us know you are in need of a due-diligence search of this type and we can make the necessary connections for you. This entry was posted in Due Diligence,OFAC,Patriot Act,SDN List. Bookmark the permalink. Nice post! I totally agree with the author that due diligence is rather required that optional these days on the market. I heard that best virtual data room services are preferable tools for this.